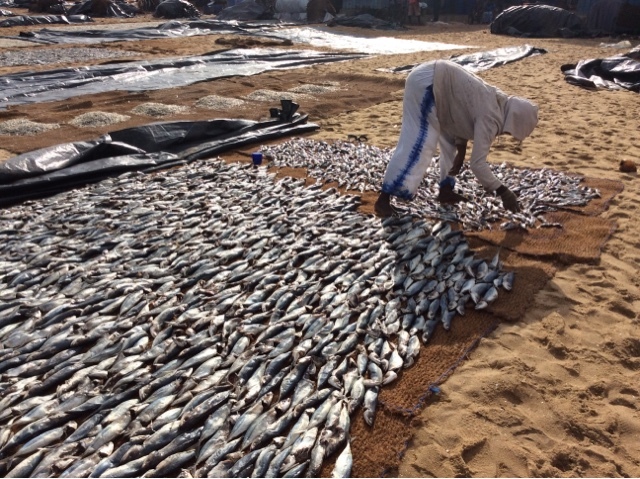 We began our morning with a visit to the fish markets, seeing an age old tradition handed down for centuries. 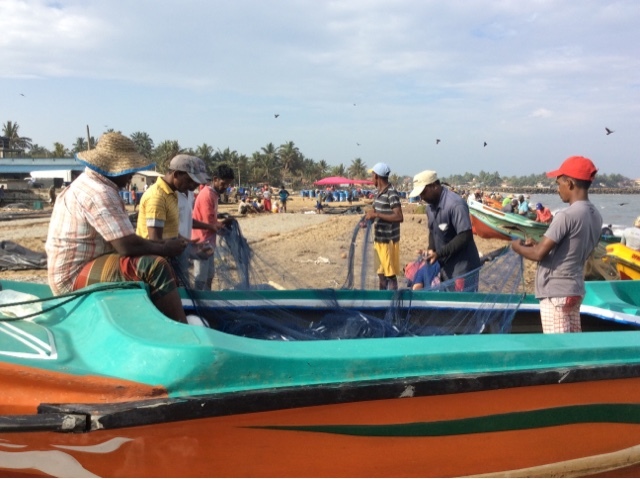 The fishermen depart in their catamarans at 7pm and return at 5am with their catch for the day, the only day rest is Sunday when they attend church. The markets had a variety of seafood which was 3/4 the price of what we would pay in Australia. Soon after we departed Negombo heading 175klm north to Anuradhapura? The roads so far are surprisingly in good condition, although it is slow going due to the tuk tuk's, trucks, and bicycles on the road. We stopped for lunch at a popular restaurant situated next to a lake, and thankfully we were blessed with a beautiful breeze to cool us. 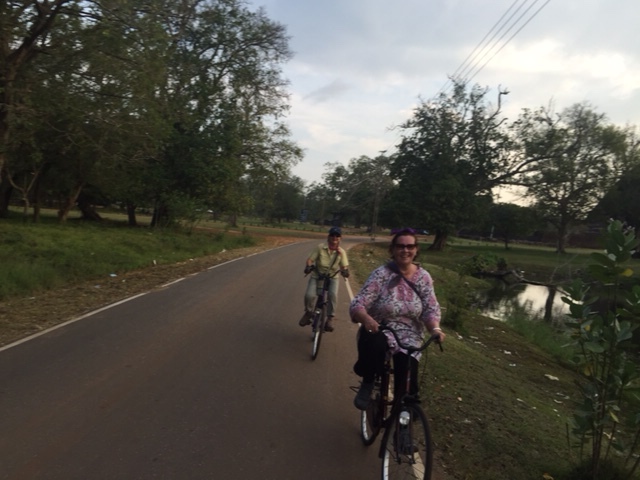 In the afternoon we were to cyclie around the ancient kingdom of Anuradhapura, Sri Lanka's first capital dating back to 500 Bc. On our journey around this UNESCO site which consisted of thousands of hectares or what we thought was more like an estate. We were quite touched by the devotion of the Buddhist people, and very conscious that we were allowed to share such a sacred place. 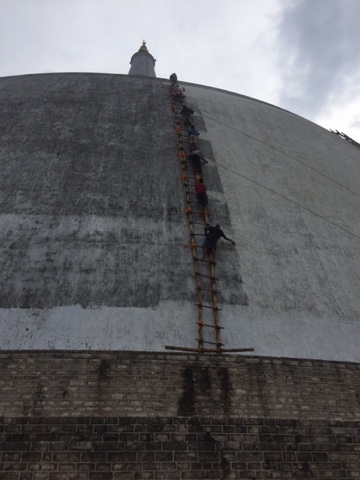 Many of the Stupas were in repair, and to see the lack of qualified workman renovating in an antiquated fashion, hanging off bamboo ladders hundreds of metres from the ground using brushes to clean the stupas was amazing. The women who were the devotees were actually rebuilding one of the stupa's handing out one brick at a time like a human chain. 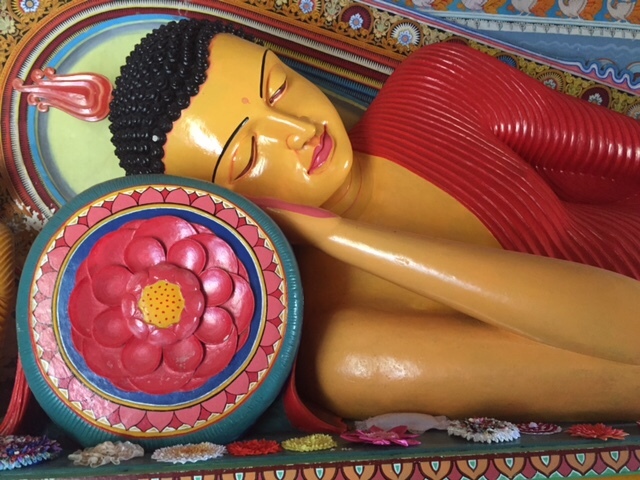 The beauty of this place is charming as you ride from stupa to stupa you cannot imagine that thousands of years before all of this ancient area was hidden by jungle and roamed by wild elephants. The ancient cities in this cultural triangle hark back to a highly developed civilisation that is over 2300 years. 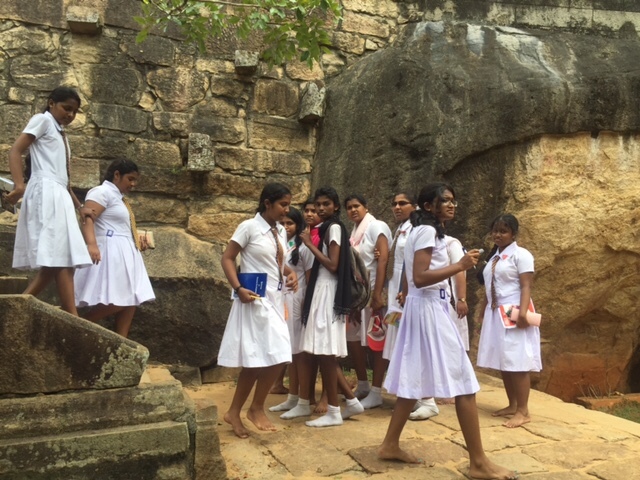 Buddhism determines the everyday life of most Sri Lankans. The cycle in itself although 4 hours was easy and we were fortunate weather wise to have a great day, cloudy sky, wafting breeze, and light rain which cooled us off and only lasted a few minutes. We spotted several monkeys, goats, cows grazing, and peacocks as we meandered through the forest, it was also fun manouvouring our bikes through the peak hour traffic, basically the locals are very polite and give tourists the right of way on the roads. Our hotel was a welcoming site, especially when we were greeted with "madam when would you like your comlimentary foot massage" we promptly replied after a dip in the pool, followed by a cold lager thank you", and that was then followed by a delicious meal and a comfortable bed, and end to an outstanding fulfilling day.